It was hard not to think of him, certainly not the fact that he’s dead. This was, in fact, something that played on my mind for a while after the film had ended: how to start a film review that had a long-departed star? For a while, maybe around a week, I let it swirl in my head for a bit, digest it a little bit more, and then swallowed the bitter pill and bit the bullet: I can’t. 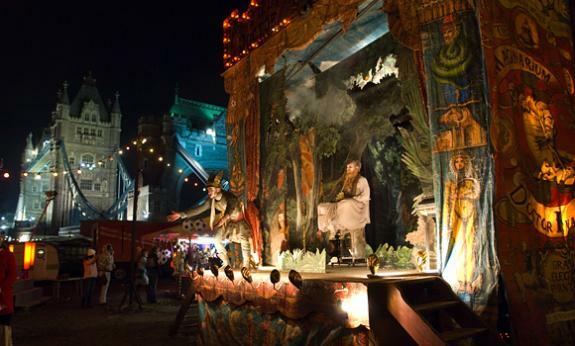 In short, ‘The Imaginarium of Doctor Parnassus’ is a fine, quirky little film, directed by a fine, quirky but not so little director, and featured some rather nice performances by the cast members. Not least of all Mr Heath Ledger. Nobody told him the 'Phantom of the Opera' audition was yesterday. The story follows an immortal thousand-year-old master name Doctor Parnassus (Christopher Plummer, though I had initially mistaken him as Max von Sydow. Or, as I couldn’t recall the name in the heat of the moment, the guy who tried to kill Tom Cruise in ‘Minority Report’). He was not originally an immortal, though, but became so after besting Mr Nick (Tom Waits) in a small little bet. He travels all over present day London with with his ‘family’ – Anton (Andrew Garfield), a wise little dwarf, Percy (Verne Troyer), and Parnassus own daughter, Valentina (Lily Cole). In their possession is a magic mirror, one that gives their audience members a chance of going into a magical reality that reflects their innermost desires (but also one that could easily turn around to blow you up). As they go about trying to make ends meet day by day, they come across a young man, Tony (Heath Ledger, and later by Johnny Depp, Jude Law and Colin Farrell), who was found dangling from his neck under a bridge. 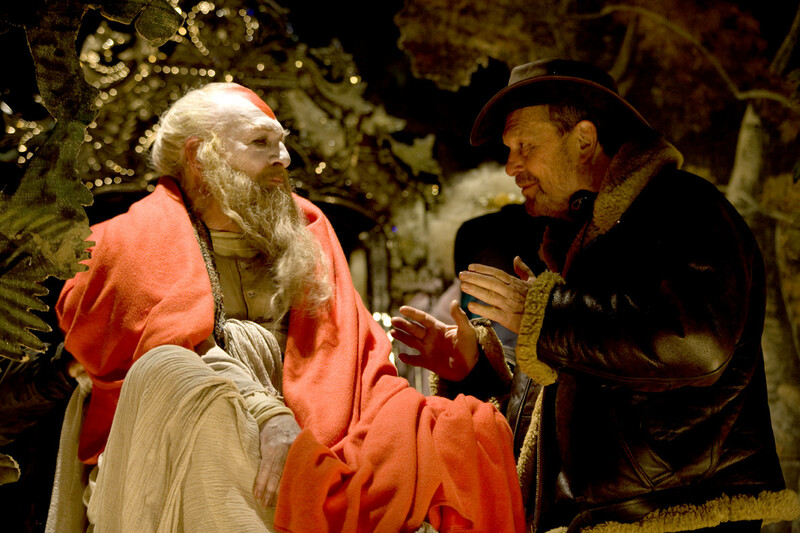 Things becomes more than just a little complicated when Mr Nick turns up, intending to collect on an earlier arrangement made between him and Doctor Parnassus. Guru Nanak wasn't in the best of conditions. 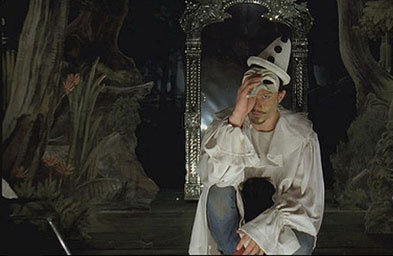 In truth, while I thought he did rather well with this particular role (especially when he’s charming different ladies to watch Doctor Parnassus’s show), it wasn’t as extreme (and therefore inherrently memorable) as his turn in ‘The Dark Knight’. Then again, given that the character itself is a maniacal psychopath, there’s little to actually compare between the two, so I’ll just stop here in that regard. With regards to the others, however, I was most intrigued initially by the inclusion of the three other actors, of Depp, Law and Farrell. Predictably, a lot of the attention was focused on Depp’s involvement (including my female friends, whose “Ah, Johnny!” was…well…not my reaction, let’s put it that way). All three of them pulled their weight and made the film something worth watching, because it’s wonderful to see the consistency between the three of them, in matching Ledger’s performance. Some of them said that they “channeled Heath” as they were shooting, a claim that the director himself concurred with. Maybe, maybe not, but credit must go to them for doing so well on such a short notice. I also like Andrew Garfield and Lily Cole a lot, I did think that their characters seemed a little simple and stereotypical. Perhaps if they were given a little more bone by the director? Christopher Plummer certain made a whole meal out of it; I didn’t recognise him at all until later on. So did Tom Waits as Mr Nick/the Devil. Loved it. Hearing of United's demise in the FA Cup, Tony went into shock. The director, too, must have a lot of the credit. Gilliam himself must have inspired many of the images in the film. The story itself is one that is reminiscent of a director’s journey: that of storytelling. I suppose that is what every director, every filmmaker in the world wants, to be able to tell their story for all eternity. This, coming off the back of some of Gilliam’s studio-ish efforts, must’ve come from the director himself. The belief Doctor Parnassus held, that without stories, the world would end, certain fits the bill of an idealist. The worlds in which the cast and crew played with was also wondrous, beautiful, a mix of CGI-aided imagination and school play production values. However, instead of detracting from it, it kinda of added a certain charm, a kind of artistic cool to the whole thing. I’d wager that Tim Burton wouldn’t be too far off if he was in his ‘Charlie and the Chocolate Factory’ mode. That’s what it felt like. Even if it wasn’t, it certainly was daring in a way. Forest Hill School put on a good show. In the end, though the film became famous because of the circumstances of its making, it should be noted that it is not just a film about Heath Ledger. In fact, I’d argue that although his picture is the biggest on the poster, the story really isn’t about him at all. It’s not even about the characters of the story, the Parnassuses and Valentinas and Mr Nicks. The film was born in the mind of the director, it was wonderfully made with his guidance (and wonderfully salvaged, lest we forget, for the transitions seemed very smooth and natural), and it became not just the last film that Heath Ledger ever made, but also a film of the director’s journey. This movie is something of a lesson in production design for Fikri. Not really sure what the comment about Guru Nanak had anything to do with the movie. Please clarify or please delete the comment or change it as that is considered offensive. The comments added to the pictures usually have nothing to do with the films themselves. It’s just that the picture reminded me of Guru Nanak and of my religious education classes back at school, so I wrote it with my tongue firmly in my cheek. No offense is intended whatsoever.